This DC area hotel is located in the heart of downtown Bethesda, a half-mile from the National Institutes of Health and within 8 miles of the White House. Must see in Washington, D.C.. Opens in a new window. LGBT destination guide: Washington, DC. Opens in a new window. Food trucks in Washington, DC. Opens in a new window. Capital theater scene. Opens in a new window. Kids in the City: Washington, D.C.. Opens in a new window. Staff were great! Restaurant was very good. Rooms are spacious and comfortable . Had a wonderful stay while visiting my son at American University! 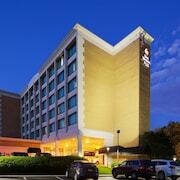 Where to find Bethesda hotels near an airport? Where can I find hotels in Bethesda that are near tourist attractions? When planning your Central Maryland escape, you can relax because you'll find an assortment of first-rate stay options in Bethesda. On our up-to-the-minute booking section you can browse 179 apartments and hotels within a 0.1-kilometre (0.06-mile) radius of Bethesda's center. Would you like to base yourself close to the beating heart of Bethesda? The Residence Inn by Marriott Bethesda Downtown and Hilton Garden Inn Bethesda are conveniently located 1 kilometre (0.6 miles) of the town center. The neighborhood of Rockville offers 13 hotels and apartments. Rockville is 12 kilometres (8 miles) from the center of Bethesda and is one of the more popular hotel areas, Some of the hotel establishments in Rockville include the EVEN Hotel Rockville - Washington DC Area and Homewood Suites by Hilton Rockville-Gaithersburg. An alternative hotel district is Gaithersburg which is located 19 kilometres (12 miles) from downtown. 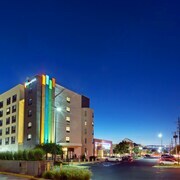 Gaithersburg has 14 hotels, including the Residence Inn by Marriott Gaithersburg Washingtonian Center and Gaithersburg Marriott Washingtonian Center. Chevy Chase which is 1 kilometre (1 mile) away is where you'll find Courtyard by Marriott Chevy Chase and Weichert Suites at Wisconsin Place. Germantown, which is around 25 kilometres (16 miles) from downtown Bethesda where you'll find Fairfield Inn & Suites Germantown Gaithersburg and Holiday Inn Express Hotel & Suites Germantown-Gaithersburg. Students, families and those watching their budget will find some great Bethesda room options that definitely won't that won't make the bank manager's jaw drop. 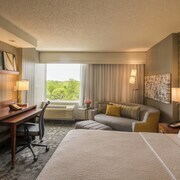 The Hampton Inn & Suites Washington DC North / Gaithersburg is 20 kilometres (14 miles) from downtown, while the Sheraton Rockville Hotel is 16 kilometres (10 miles) away. 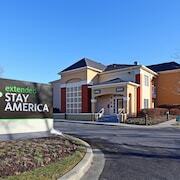 Alternative affordable room options are the Holiday Inn Express Hotel & Suites Germantown-Gaithersburg and the TownePlace Suites Gaithersburg by Marriott. The Four Seasons Hotel Washington D.C. is located 9 kilometres (6 miles) from the main part of Bethesda. Alternatively, the Rosewood Washington, D.C. is situated 9 kilometres (6 miles) away. Some more hotel options worth looking into include the The Ritz-Carlton Georgetown, Washington, D.C. and the The Jefferson, Washington, DC. The greater Central Maryland area is certainly worth discovering as well. If you love nature, be sure to explore Central Maryland's coastal plains. In addition you could go to a selection of the region's street art. Visitors in this part of United States of America can enjoy shore fishing, sailing and boating. 55 kilometres (33 miles) from Bethesda is Baltimore, where you can visit National Aquarium in Baltimore and Washington Monument. Should you wish to stay in Baltimore, check out the Four Seasons Hotel Baltimore and Baltimore Marriott Waterfront. 55 kilometres (34 miles) to the northeast of Bethesda, is Downtown Baltimore, home to the Inn at the Black Olive and Renaissance Baltimore Harborplace Hotel. While in Downtown Baltimore, be sure to visit the Green Mount Cemetery and Mother Seton House. 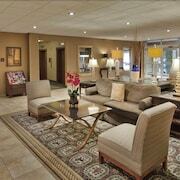 Situated 16 kilometres (10 miles) from Bethesda is Ronald Reagan Washington National Airport. Stay nearby at Mandarin Oriental, Washington D.C. or Residence Inn Washington, DC /Capitol. 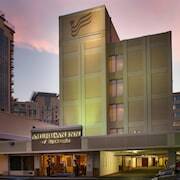 What are the most popular Bethesda hotels? Are there hotels in other cities near Bethesda? What other types of accommodations are available in Bethesda? Explore Bethesda with Expedia.ca’s Travel Guides to find the best flights, cars, holiday packages and more!